Redmi 5 and Redmi 5 Plus smartphones were launched by the Chinese manufacturer at an event in Beijing on Thursday. The smartphones bear similar designs and some common specifications, however, there are some prominent differences, from screen size to the choice of the processor being used. The highlight features of the Redmi 5 and Redmi 5 Plus include the use of an 18:9 display aspect ratio, giving an immersive wide-screen effect that according to Xiaomi is better for gaming and media consumption, apart from a soft-toned selfie light for improved low-light photography. Both the Redmi 5 series smartphones were launched for the China market, and for now, there is no information of when they will be made available in other countries. The dual-SIM (Nano-SIM) Redmi 5 and Redmi 5 Plus bear nearly identical specifications, as we mentioned, with only a few differences. The Redmi 5 sports a 5.7-inch HD+ (720×1440 pixels) 18:9 display with a 282ppi pixel density and a 72 percent NTSC colour gamut, while the Redmi 5 Plus sports a 5.99-inch full-HD+ (1080×2160 pixels) 18:9 display with a 403ppi pixel density and an 84 percent NTSC colour gamut. The former is powered by an octa-core Snapdragon 450 SoC clocked at up to 1.8GHz, while the latter is powered by an octa-core Snapdragon 625 SoC clocked at up 2GHz. RAM options on the Redmi 5 are 2GB and 3GB, whereas the Redmi 5 Plus offers 3GB and 4GB options. Both smartphones bear the same cameras. The Redmi 5 and Redmi 5 Plus offer a 12-megapixel rear camera with a 1.25-micron pixel sensor, a f/2.2 aperture, PDAF, and flash, while they also sport a 5-megapixel front camera with a soft-light selfie flash module. The company is also touting the inclusion of its Beautify 3.0 app, for improved portraits. They both come with fingerprint sensors on the rear panel, forgoing the home button at the front completely. As for storage, the Xiaomi Redmi 5 offers 16GB or 32GB of inbuilt storage, expandable via microSD card. The Redmi 5 Plus, on the other hand, offers 32GB or 64GB of inbuilt storage, also expandable. 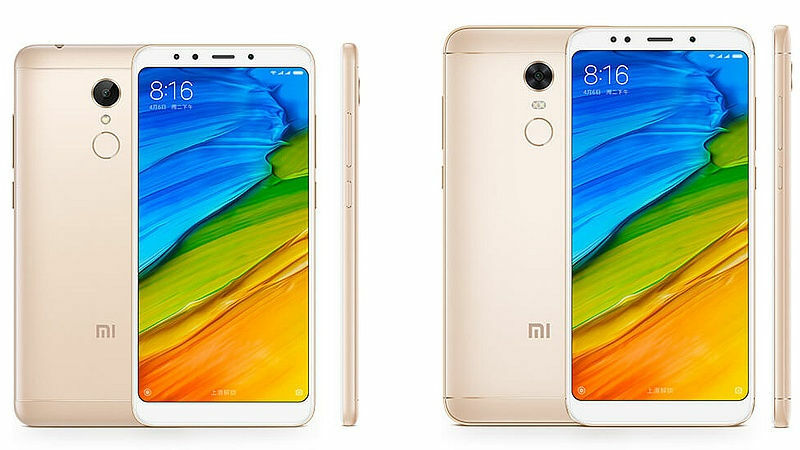 The smartphones offer standard connectivity options, such as 4G VoLTE, Wi-Fi 802.11 (b/g/n on Redmi 5 and a/b/g/n on Redmi 5 Plus), Bluetooth v4.2, GPS/ A-GPS, 3.5mm headphone jack, and Micro-USB. They both feature an accelerometer, ambient light sensor, gyroscope, and proximity sensor. The Redmi 5 bears a 3300mAh battery, while the Redmi 5 Plus bears a 4000mAh battery. The former measures 151.8×72.8×7.7mm and weigh 157 grams, while the latter measures 158.5×75.45×8.05mm and weigh 180 grams.